HighTechScience.org's "CompuRobot & George the Robot"
The CompuRobot and George the Robot are approx. 7" tall and have a 4-bit microprocessor that allows them to store up to 48 command sequences. These sequences are entered via a 25-key keypad located on top of CompuRobot's head. The manual includes several example programs that range from simple to advanced. 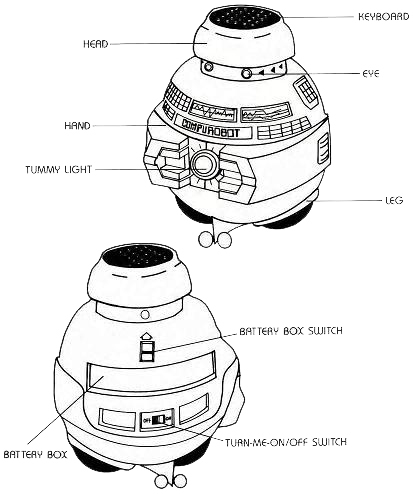 If you have ever seen the 1979 Disney movie, "The Black Hole" then you will agree that the "CompuRobot" and "George the Robot" are incredibly similar to the "V.I.N.C.E.N.T." robot from the movie. Fully programmable via 25 special program keys built into his head. CompuRobot is capable of executing complex routines including 3 different gear speeds and even sounds. He even has a built-in headlamp so you can run him in the dark.